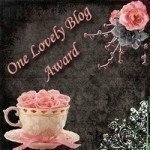 >Thank you to Sand and Sea Designs for this lovely blog award…I haven’t had time for much blogging these past days so thanks Wendy for giving me a reason for a quick posting! I’ve been busily working on jewelry orders and unfortunately my studio is in a bit of chaos, so fresh cooked beads from the kiln are scarce right at the moment. That will change soon as I get back on track..bear with me and stay tuned! >Thanks for the award! I am so happy to be recognized … made my day! You are currently reading >Blog award at fireandglass.